Whether your family is filled with buckaroos or city slickers, a dude ranch vacation makes the most memorable family trip. 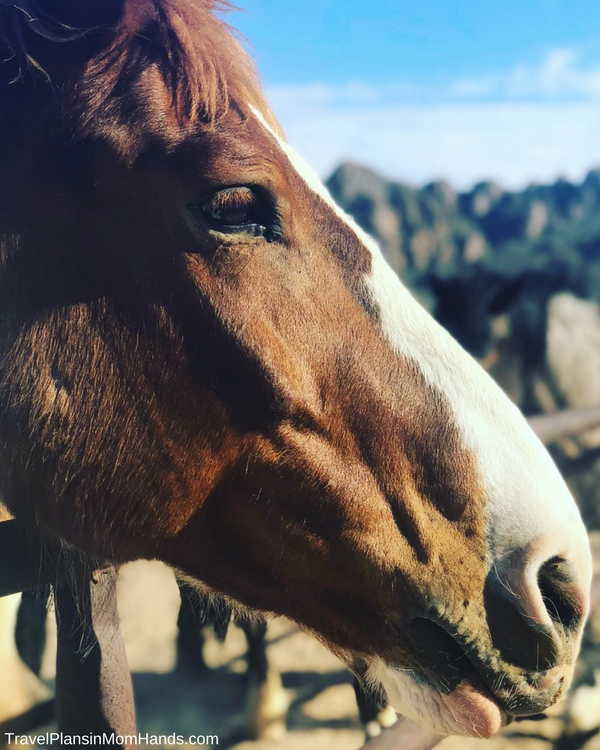 From the outdoor adventures like horseback riding and hiking to the friendliness of fellow guests and staff, guest ranches are truly unique destinations that go far beyond a typical hotel or even booking a house. It’s that sense of camaraderie and shared experiences that have families coming back for more. 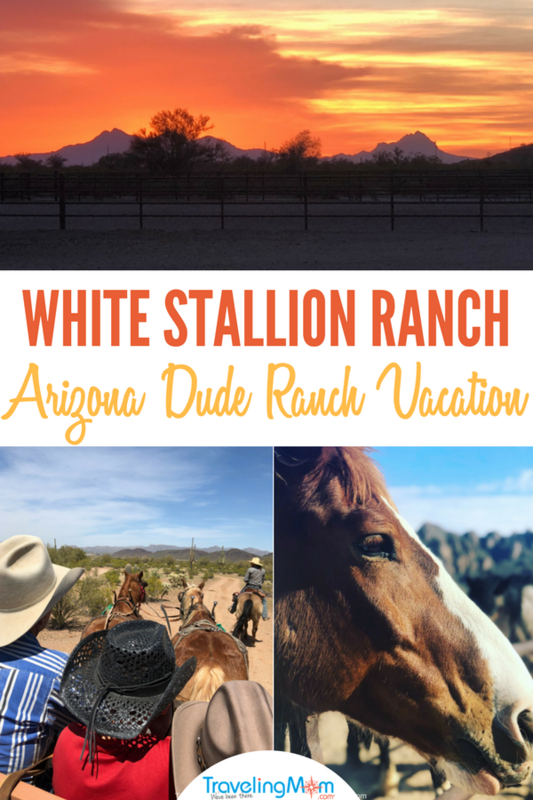 And White Stallion Ranch in Tucson, Arizona is the quintessential dude ranch for family fun in the sun. 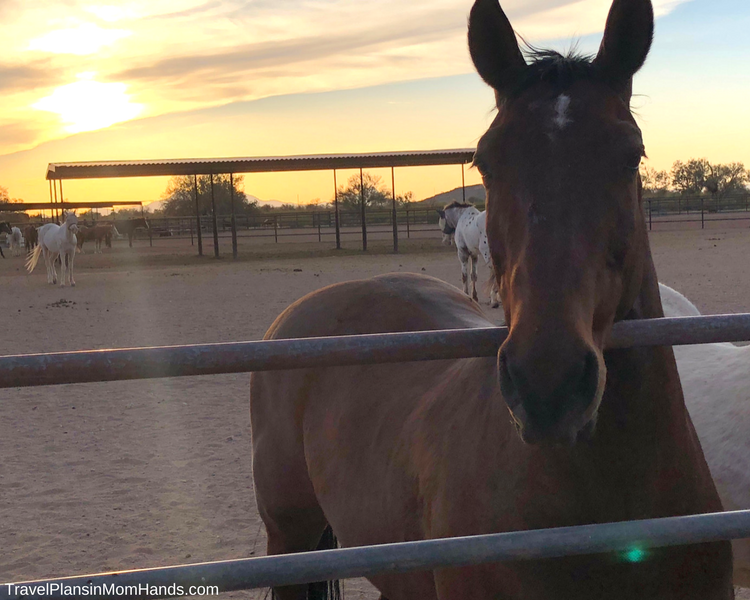 Horses and sunsets at White Stallion Ranch. Doesn’t get much better than this! Photo by Sherry Boswell, TravelingMom with Teens. Hayrides and hamburgers. Campfires and guitar music. Blueberry pancakes and horseback riding. If these sound appealing, then grab a hat and some boots, and get ready for the family vacation to be talked about for years to come: a dude ranch! White Stallion Ranch in Tucson, Arizona knocked our boots off with its hospitality, amenities, and atmosphere. Which begs the question: why choose a dude ranch vacation and specifically, why White Stallion? A Family Dude Ranch Vacation: THE Trip Your Family Will Be Talking about 10 Years from Now! 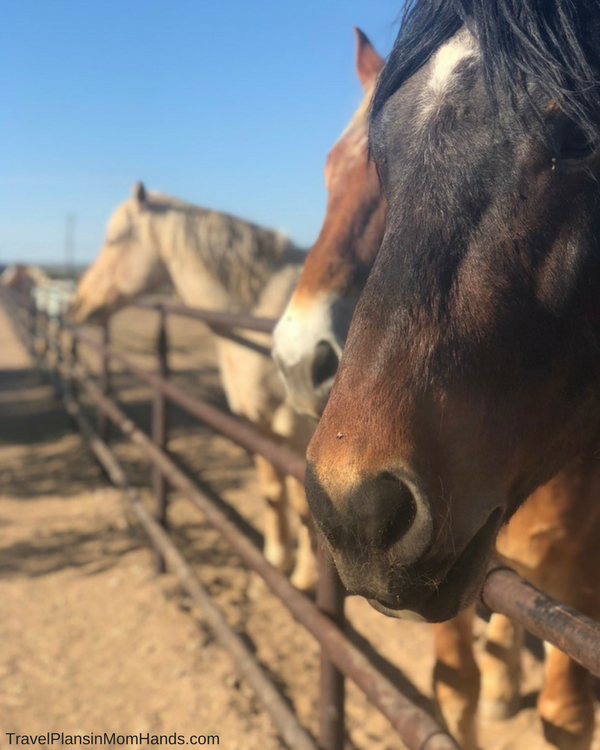 If I had to sum it up in one sentence, then I’d say a ranch vacation is safe, friendly, fun, relaxing, nature-centric, educational, and driven by family-oriented service from owners and staff who treat you like a guest in their home. Wow-that’s a mouthful! This is our family’s second ranch vacation, and I cannot recommend a dude ranch more highly. It merges the best of what families hope for in a vacation: quality time, great experiences, adventures, relaxation, and truly welcoming and hospitable service. The beauty of a dude ranch is that guests can handpick their experiences on a daily basis. The diversity of activities and the freedom from technology (a huge thing in our family) is a combination that’s quite intoxicating! Plus, a dude ranch vacation offers new activities and new people. And a huge bonus for kids, it enables them to spread their wings in a safe setting, assert independence, and make new friends. 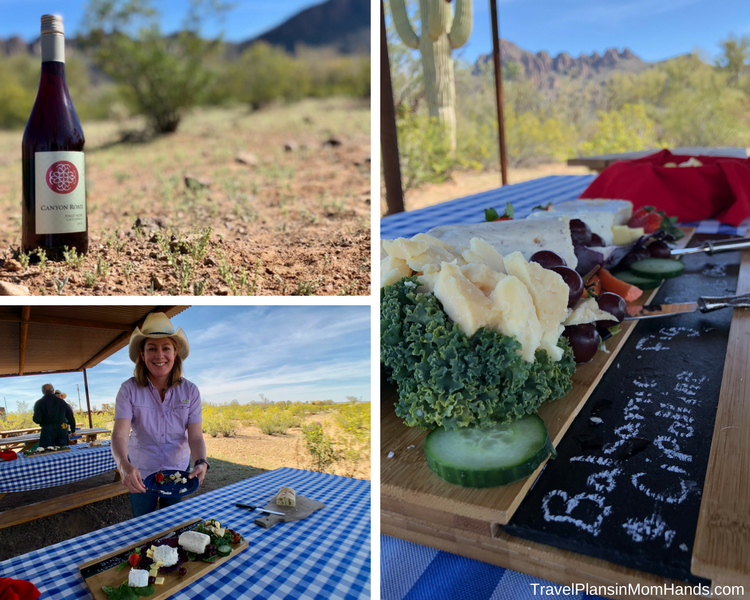 Learn more about all TravelingMom dude ranch experiences. and find reputable ranches via the Dude Ranchers’ Association. The slow rides are easy going and it’s truly invigorating to push beyond the norm on vacation. Whether a skilled rider or a novice, guests will have plenty of options and are paired with a horse to match their riding abilities. I couldn’t resist saying “Ride like the wind” to my son’s horse, Bullseye, every day! Ride like the wind, Bullseye! (Sorry, couldn’t resist!) Photo by Sherry Boswell, TravelingMom with Teens. 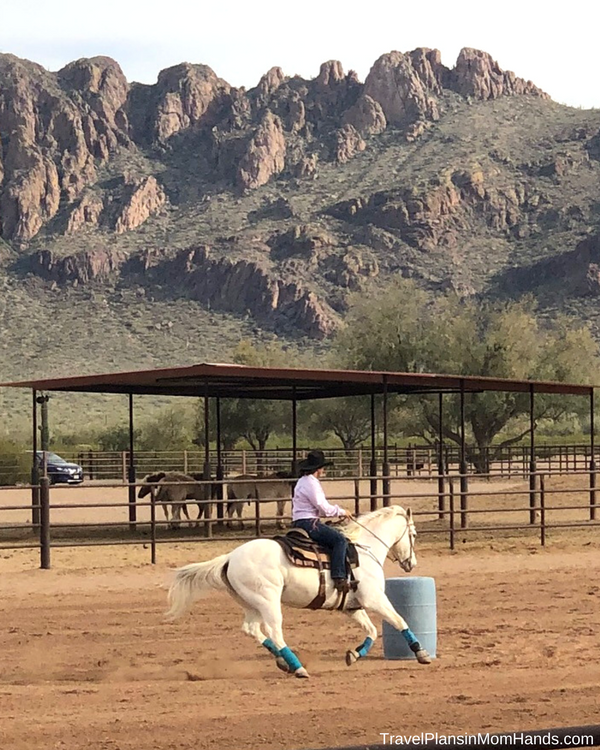 White Stallion Ranch in Tucson, Arizona has been perfecting ranch life living since 1965 when its owner Russell True was a child of the then owners, Allen and Cynthia True. His parents began purchasing adjacent land as it became available, increasing the ranch to 3,000 acres. Today, the ranch boasts 43 rooms and a 5 bedroom Hacienda. The Dude Ranchers’ Association has a quote that says it all about dude ranches: “Horses, Hats, Hospitality, Heritage, Honesty and Heart. These are the foundations of every ranch.” None more so than the True family’s White Stallion Ranch. This guest ranch has been a labor of love for the True family since 1965. That sense of family and love is imbued into the essence of the ranch, from the staff to the hospitality to the little details like photos in the ranch’s lobby dating back to its founding. The family has their hands in every facet of the ranch, from wrangling and managing staff to serving breakfast cookouts and grilling your steak for dinner. Maybe that explains why White Stallion feels like home almost from the get-go. Let’s face it, one of the biggest reasons to try a dude ranch is because of the endless riding opportunities available. Except on Sundays as that’s the horses’ day off! For this reason, Sunday is often a good arrival or departure day. After providing information about height, weight, and riding ability, all guests are paired with a horse that will meet their needs. My horse Marshall was a gentle giant and the perfect match for my intermediate abilities. Horse and stunning background? One epic photo taken by my teen. Photo by Jared Boswell, son of TravelingMom with Teens Sherry Boswell. Rides vary daily and are posted in advance. Sign up sheets are available in the lobby beginning around 12:00 until around dinner. Offerings included: Slow and Fast Rides; All Day Ride; Half Day Rides; Breakfast Ride; Team Penning; and Lessons. Most guests combine a number of rides during the day, pairing up slow and fast rides and team penning. Fast rides involve loping (cantering) and guests have to pass a test to do those rides. No worries-it was pretty easy since I managed to pass! My favorite rides all centered around food…go figure! After an early morning mount at 7:30, it’s well worth it to have breakfast while taking in the views of the Sonoran desert, Rattlesnake Ridge, and Panther Peak. The reward: delicious blueberry pancakes, eggs, bacon and sausage, and breakfast potatoes (so GOOD)! 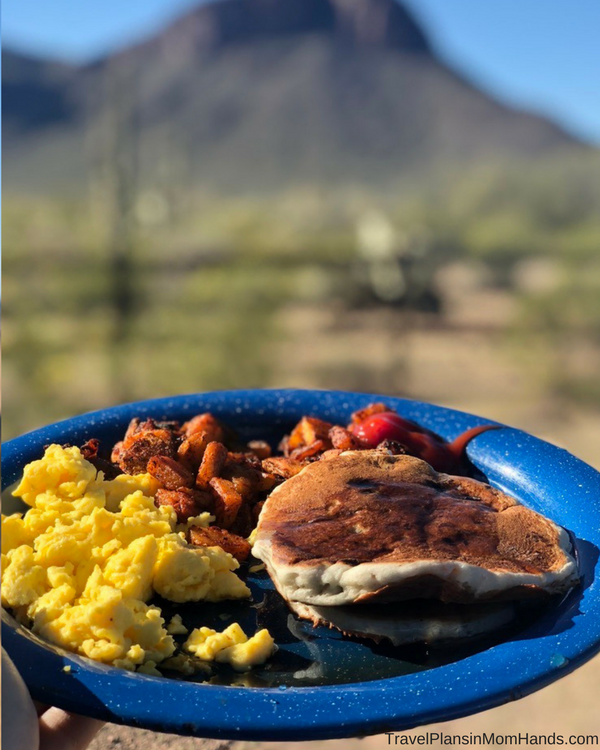 Taking advantage of spectacular views at a prime location overlooking the mountains, this breakfast spot really sets the tone for what’s to come on this dude ranch vacation: lots of riding, beautiful landscapes, plenty of food, and getting to know friendly people. Will ride for breakfast. Especially when it boasts the legendary White Stallion blueberry pancakes! Photo by Sherry Boswell, TravelingMom with Teens. 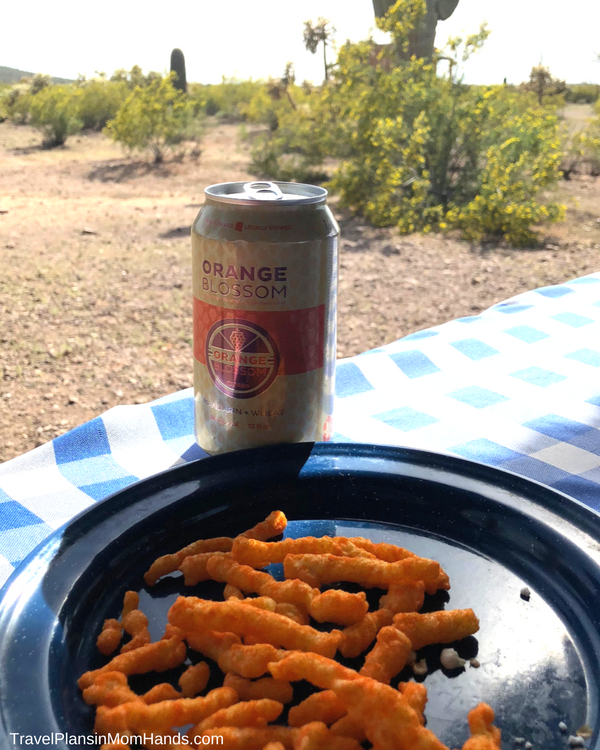 The ORANGE blossom special: orange Cheetos and beer for this unique adults-only ride. Photo by Sherry Boswell, TravelingMom with Teens. The description of this ride had me at hello: slow ride to a secluded spot and enjoy a unique selection of wines and assorted cheeses, crackers, and bread. Happy hour practically on horseback! Sampling Canyon Road wines and chatting with fellow guests in a shady spot, I relished this communal and friendly feeling. It was one of the most leisurely and relaxing afternoons I’ve had in quite some time. This had to be one of the most fun activities I tried at the ranch. Here’s how it works: teams of 4 ride “Bonanza” style into a herd of cattle in our rodeo arena and separate out three to move to a pen. The team with the best time wins! It’s all about teamwork, so wranglers will give you tips and instructions. We actually did a total of 4 rounds to better their time. True to its billing as both exciting and challenging, this was an absolute thrill ride. For our rounds, there were serious bragging rights at stake. I was on a team with family members competing against another team from their family. In the end, we had 2 rounds at 20 seconds and 2 rounds at 18 seconds, but we lost by a mere second! FYI: Team Penning is classified as a fast ride and only available to children 8 years old and over. TravelingMom Tip: After the first day, my son cleared the test for fast rides, and then they became his preference. But after my first fast ride, I was convinced that I should stick to only slow rides. Dilemma: let him do his own thing even if it meant us doing different rides? Absolutely! Don’t hold the kids back from trying the more challenging rides. Mine did the all-day ride and LOVED it. The only age requirements for kids are as follows: 5 or older to ride, and 8 or older to test for fast rides. Luckily, wranglers offer lessons (at an extra charge) for those that may need some pointers. Horses line up at the fence for their daily treats. Be sure to pick them up in the ranch lobby or prepare to be snubbed by these gentle giants. Photo by Sherry Boswell, TravelingMom with Teens. 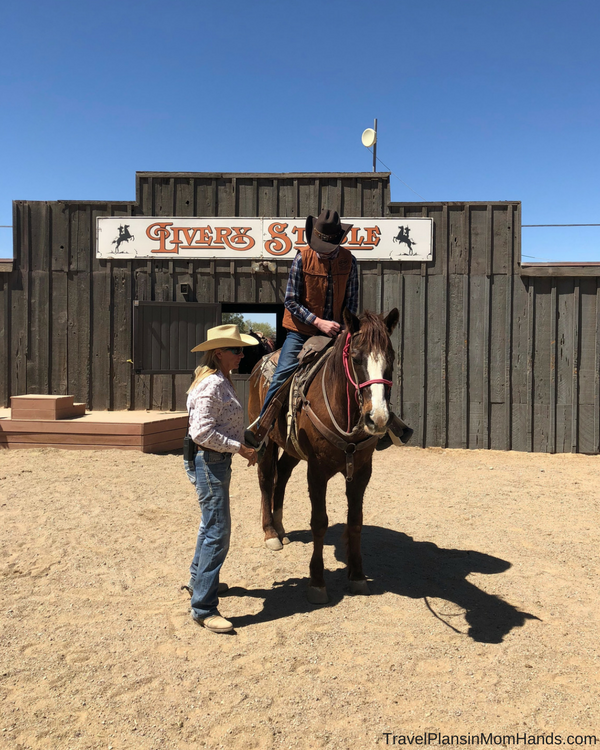 Horseback rides are primo at a dude ranch, but what happens when cowboys and cowboys dismount and get OUT of their saddles? Well, at White Stallion Ranch, A LOT! Hikes of varying levels, nature walks, and fitness center provide exercise options. Then there’s tennis, basketball, a movie theatre, a petting zoo, and a game room featuring air hockey, foosball, ping pong, shuffleboard, and a pool table. One of my grandfather Opa’s favorite sayings was “anyone who doesn’t like this is crazy!” Yep, Opa, that’s the phrase for White Stallion. And the LAST phrase kids will utter is “I’m bored!” because there is SO much to do. White Stallion Ranch has uniquely positioned itself as the ONLY property in Tucson to have rock climbing on site (i.e. not on leased land). The benefits of this are as enormous as the boulders we got to climb. Instead of spending several hours in travel time getting to the rock climbing destination, we were there in under 15 minutes! Independent contractor Wild West Climbing offers climbs for beginners to experts. Our certified guide Wade Purswell showed us the ropes (literally) as we climbed boulders and faces on the East end of the ranch. He has designed beginner, intermediate and advanced climbs. My son and I climbed about 35 feet, and it was a wicked cool experience. Although the views are fabulous, I didn’t look around much because I focused hard on where I was putting my hands and feet. Trust the ropes: all the gear, ropes, and the harness are designed to hold at least 3,000 pounds. Also, Wade used a multi-knot system to back up the safety quotient. Always appreciated when trying a new activity and dangling 35 feet up in the air! 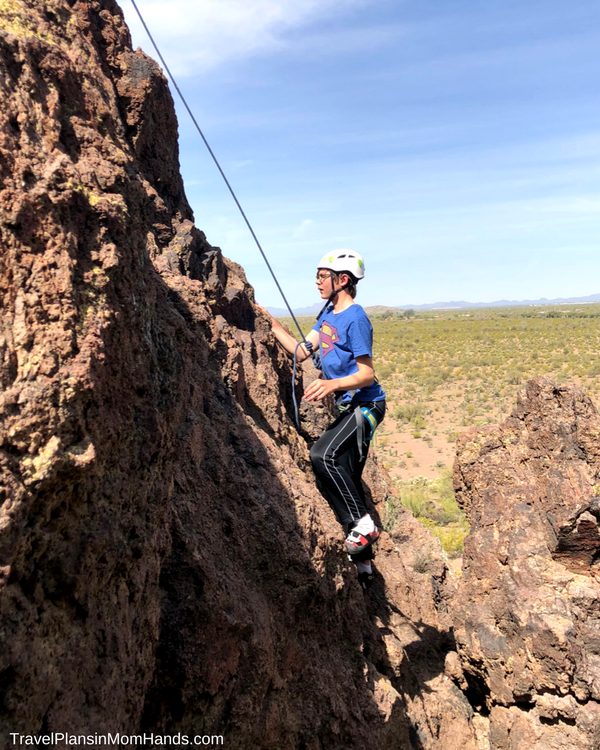 Even though we’ve tried indoor climbs before, being outdoors and hiking in the Sonoran desert added to the drama and heightened the thrills. TravelingMom Tip: When trying rock climbing, make sure that your specific guide is certified. 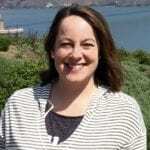 Ours was an AMGA and PCGI Certified Climbing Instructor. Very important! Another key was the special shoes that help grip the rocks. They had a special rubber sole similar to the material used for race car driving tires. 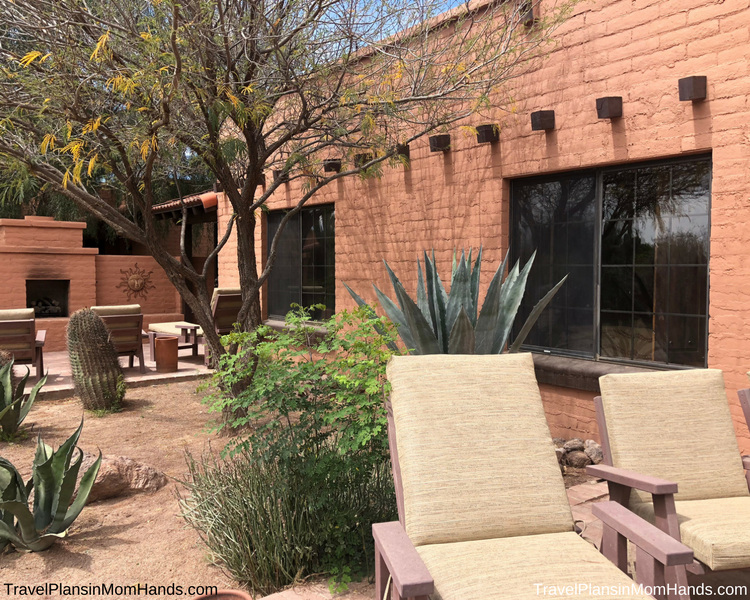 While it’s not surprising to find a spa at most resorts, it was a welcome treat that this guest ranch offers so many services, ranging from facials, massages, and body wraps. Especially for those like me who don’t ride that frequently. Translation: my sore muscles were all but begging for a massage. I opted for the herbal detox body wrap with Angela, a positively heavenly treatment that has many positive benefits to circulation and lymphatic draining and conveniently ends with an aromatherapy massage. Afterward, I was one happy camper and my skin glowed from purging all the toxins. See, yet another benefit of a dude ranch vacation! “A dip in the pool, a trip to the spa, endless days in my chaise, the whole world” after riding at White Stallion Ranch. (Bonus points for those of you who recognize the musical I was quoting!) Photo by Sherry Boswell, TravelingMom with Teens. After a few hours in the saddle, nothing appeals more than a dip in the pool followed by a relaxing soak in the indoor hot tub. Lounging poolside with a good read and listening to the kids play Marco Polo may be one of the highlights of my trip simply because it felt like such a guilty pleasure. A real hot spot to cool down on the ranch. The evening schedule includes a social hour and dinner, followed by special entertainment. Every evening had a different activity scheduled. From country western dancing to a cowboy campfire to watercolor painting class, dance, music, and art were the focal points. And for pure entertainment, we were wowed by Loop Rawlins, a one-man Wild West show. 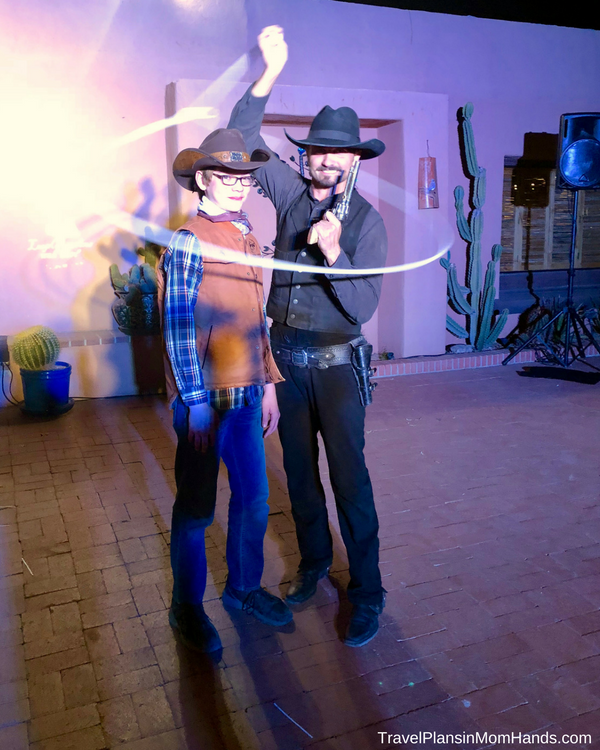 He does trick roping, whip cracking, and gun spinning–try saying those 3 things fast! Loop has performed with Cirque du Soleil and made it to the quarterfinals of America’s Got Talent, and we could see why! Loop is one rootin’ tootin’ great performer! Loved his high energy gun slinging, trick roping, and whip cracking. Photo by Sherry Boswell, TravelingMom with Teens. My son’s favorite had to be the Critter Class with Phil Garcia featuring snakes, scorpions, and tarantulas as well as other desert creatures. He held a Burmese Python and got to play with an adorable chinchilla named Pikachu. 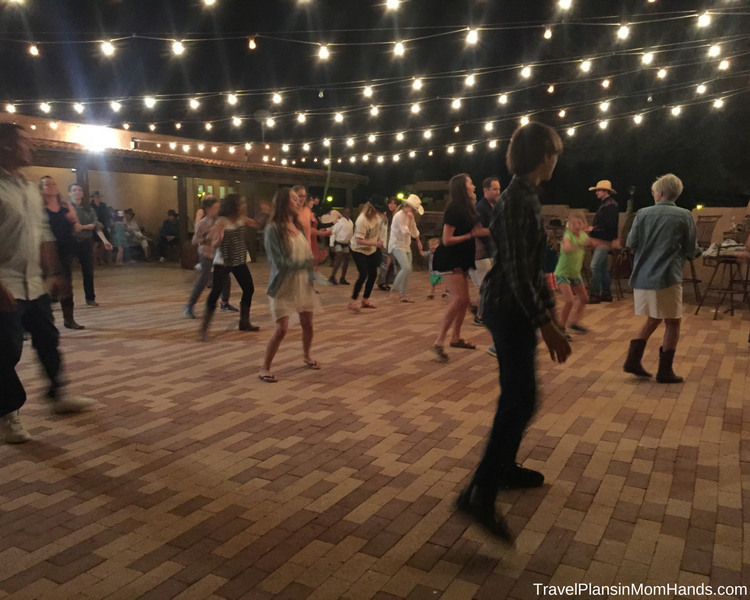 You can “get down, turn around, go to town, boot-scootin’ boogie” at White Stallion Ranch. Photo by Sherry Boswell, TravelingMom with Teens. Of course, my vote for the best way to unwind after a long day in the saddle? Hot tub, followed by some time on the patio in front of our fireplace. TravelingMom Tip: Don’t miss the White Stallion Ranch Rodeo highlighting barrel racing, bulldogging, and team roping. Wranglers and staff at the ranch show off their skills. Photo by Sherry Boswell, TravelingMom with Teens. 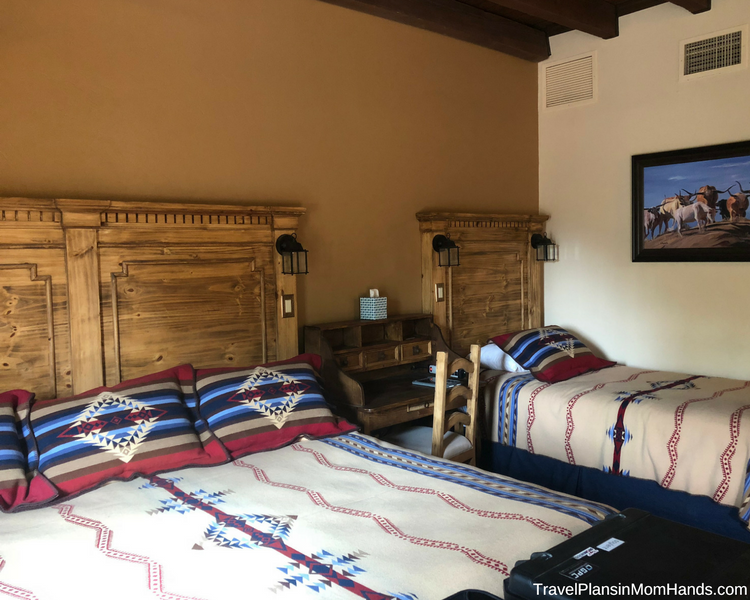 The ranch prides itself in not being under the label “luxury.” But the accommodations are totally deLUXE in a Western, home-y sense. Family suites at White Stallion have private patios, some with gas fireplaces. Photo by Sherry Boswell, TravelingMom with Teens. Don’t expect to see TVs in any of the rooms. What you will find: private patio, plush robes, safe, refrigerator and hair dryer; local art and handcrafted furniture adorning every room. Our king/twin deluxe family suite (number 25) had a sitting area, a desk/work area, and plenty of closet space. Spacious rooms for families and great Western theming at this ranch. Photo by Sherry Boswell, TravelingMom with Teens. Two bragging points of the ranch: it has ranked #1 in Tucson lodging for 6 years and running on TripAdvisor, and solar panels provide 35-40% of all the ranch’s electricity. Our digs here were quite a contrast from our dude ranch glamping vacation. But that’s what I love about dude ranches–each one is connected with the location and the culture of the area. Come and get it! When they rang the railroad bell for dinner, we eagerly showed up at the set meal times. Breakfast included a cooked-to-order menu as well as a continental buffet. Each day featured a special breakfast dish like huevos rancheros or Eggs Benedict. Lunch and dinner were always buffets with both indoor and patio seating. Most always, we opted for the patio to enjoy the fresh air. Lunch featured two entrees, several side dishes and salads, a salad station and a sandwich bar. Afterward, we usually snagged a cookie or some fresh fruit. 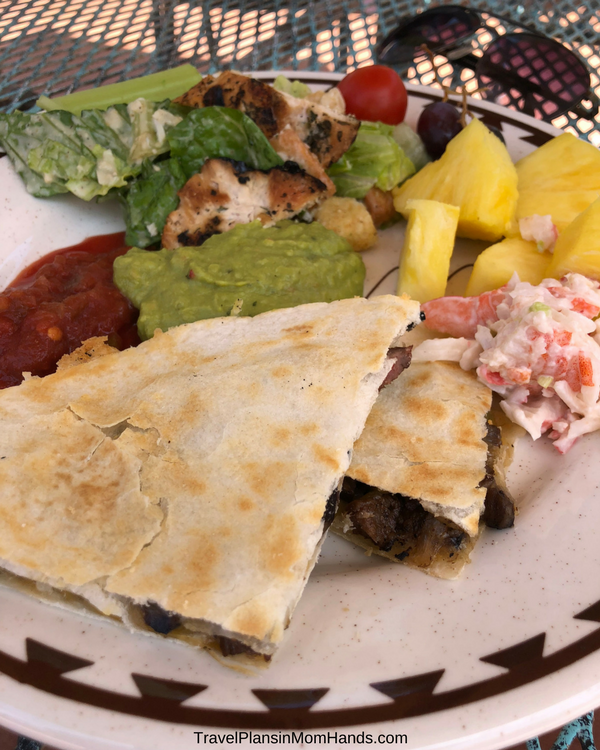 Lunch of champions: quesadillas! Buffet style meals mean lots of options and seconds! Photo by Sherry Boswell, TravelingMom with Teens. Dinner entrees are prepared mostly on the outdoor grill for that “home on the range” feel. Usually comprised of two entrees and a medley of side dishes. We enjoyed a selection of snacks between meals, including fresh fruit, chips and salsa, and trail mix. Ditto for coffee, cappuccino, hot chocolate, hot and cold teas and lemonade which are available all day. The ranch is willing and able to accommodate alternate diets, and many gluten-free and vegetarian options were available at every meal. My red meat averse spouse could always find something else to have (such as chicken or fish). Foodies may be a bit off-put by the buffet meals, but we found the food to be delicious. Our favorites included the breakfast ride blueberry pancakes, the hayride lunch cookout, steak night (naturally), and the barbecue ribs. 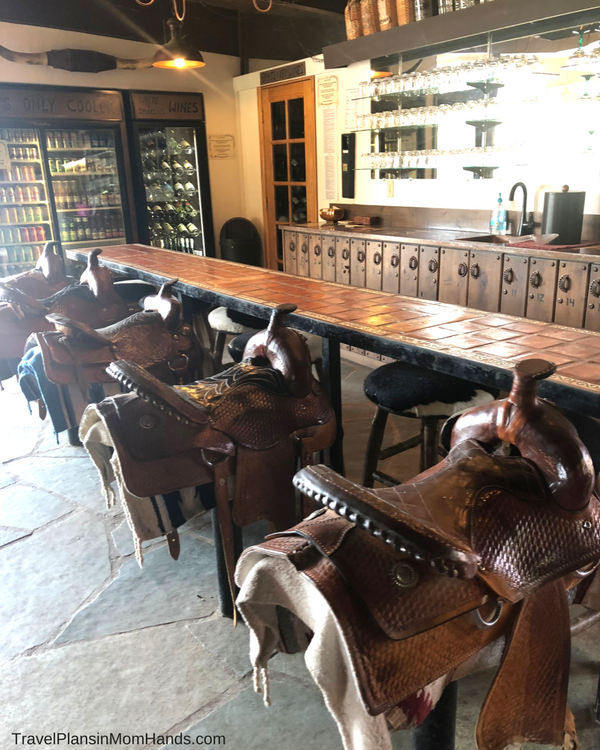 One of the most inventive areas of the ranch is the beverage area where we could sit on a saddle as our bar stool. Of course, the little cowpokes LOVE this seating, too. Best in the West bar prize goes to these saddle bar stools. Photo by Sherry Boswell, TravelingMom with Teens. White Stallion Ranch has an honor bar where guests fill out “chits” (little sheets) with their drink purchases. We would mark down our wine, beer, and margaritas on these forms, and the ranch totals them up at checkout. Premium wine and liquor are also available for purchase from a fully stocked, locked closet. Pretty cool concept! 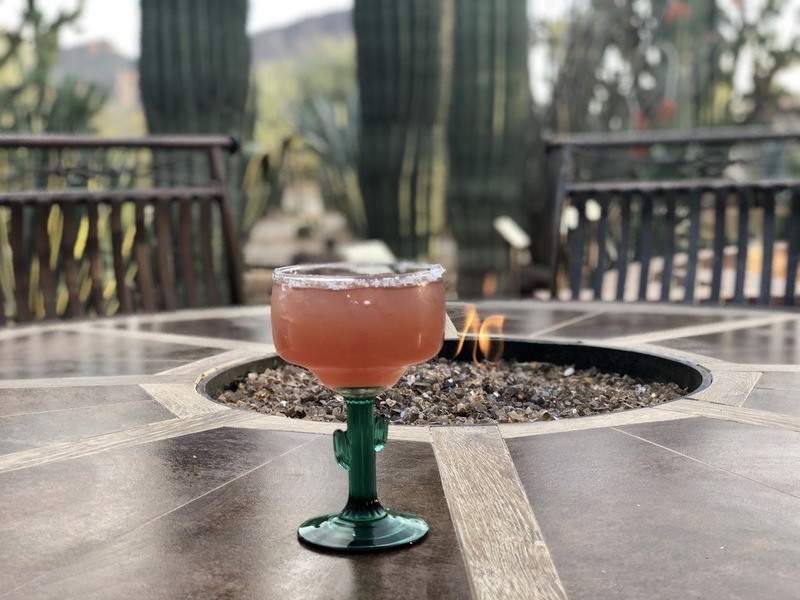 My social hour go-to drink: a prickly pear margarita. Photo by Sherry Boswell, TravelingMom with Teens. 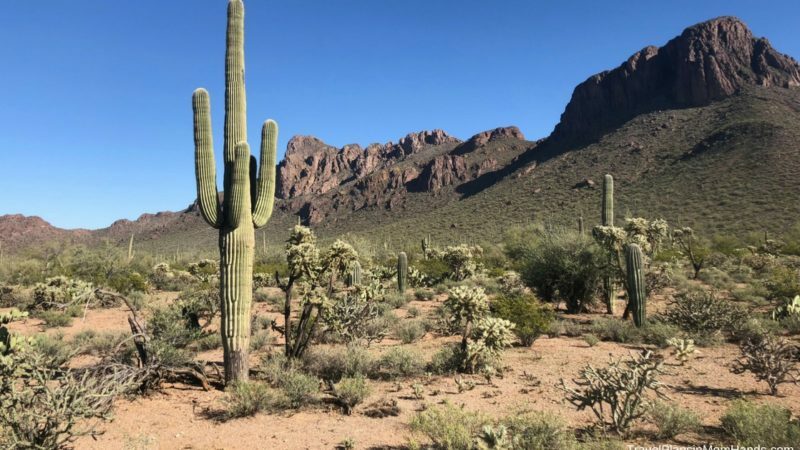 Located at the foot of the Tucson Mountains and adjacent to Saguaro National Park, the 3,000-acre ranch is something very special. Its allure is palpable from the moment the horses playfully pad their hooves in the dirt. Not surprisingly, Hollywood too has been enamored by this region. Since the early days as a backdrop in Western feature films and later, as the location for the television series High Chaparral, White Stallion Ranch has consistently attracted the attention of Hollywood producers. 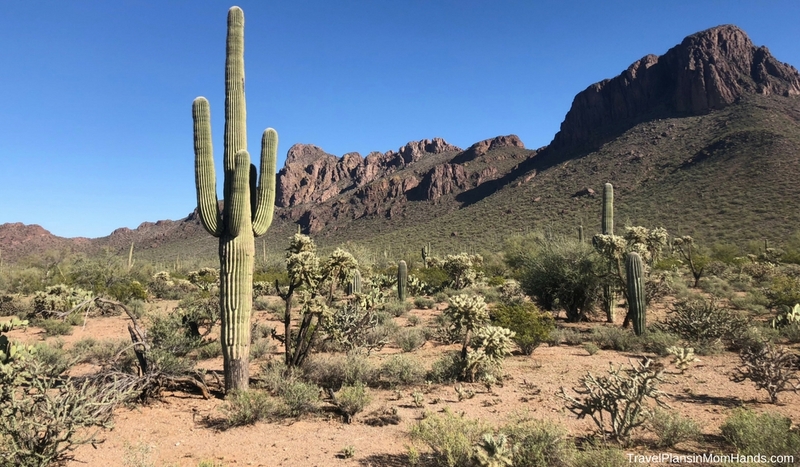 The Sonoran desert is calling so I must go. Photo by Sherry Boswell, TravelingMom with Teens. Although a massive property, it is but a short distance (5-10 minutes) to shopping, restaurants, and activities. Not that you’ll need it. In fact, the point of a dude ranch vacation is to stay on the ranch and soak in all that there is to offer. 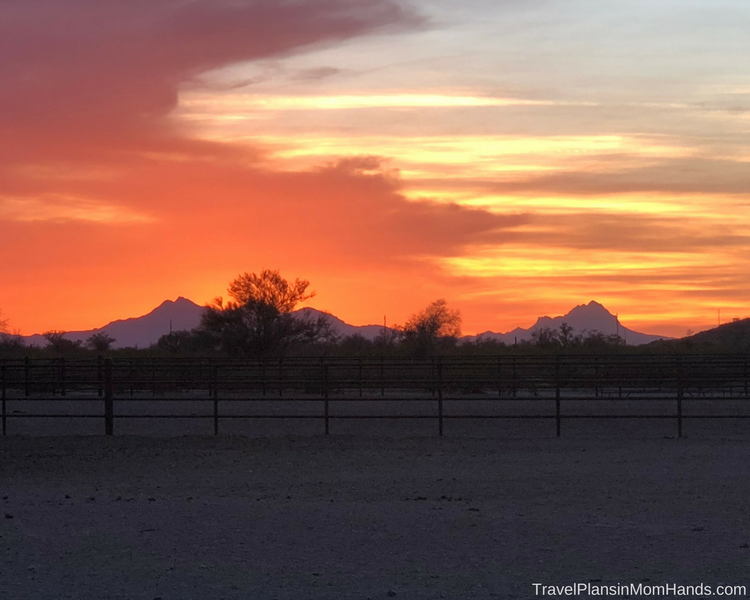 TravelingMom Tip: Arizona as a destination isn’t too shabby. 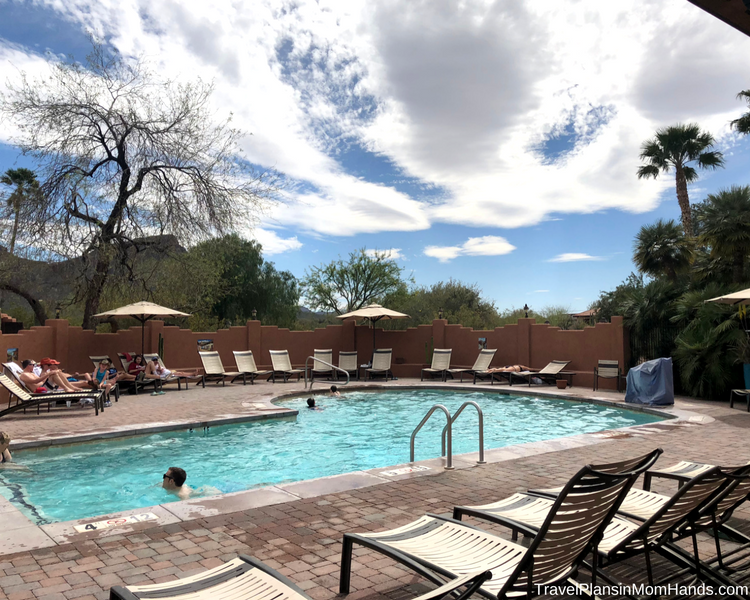 The fun part is crafting a vacation that also includes other pit stops like the Grand Canyon, Sedona, Phoenix, Scottsdale, and Tucson. Word to the wise: do those things first before arriving at White Stallion. We chose to visit Phoenix and Tombstone before beginning our ranch vacation. Turns out that was a good call because we were hard pressed to leave the ranch once we saw all that it has to offer! BONUS: No resort fee! Use of all ranch facilities, all daytime activities and evening entertainment is included. Not included are alcoholic beverages and sodas, horseback riding lessons, spa treatments, and gift shop purchases. That’s about as close to all-inclusive as it gets, something I appreciate because my family prefers our vacations to not follow us home on credit cards. Another tip of the hat goes to the White Stallion for not overpricing items in the gift shop. We found the western gear and souvenirs to be very reasonably priced and purchased hats for the 3 of us to wear on our rides. As a mom of two teens, I am constantly looking for vacations that allow my teens their independence and opportunities to build their confidence. Being in a dude ranch bubble with likeminded families and lots of options for the kids to choose from gave mine the independence he craves. And I had peace of mind knowing he had so many options and kids his age to hang out with. This is especially true during holidays like Spring Break, Thanksgiving, and Christmas. We made friends with several couples and found that so many guests end up planning their return stays together. I was really impressed at how many multigenerational families had planned this as a reunion of sorts. One couple actually met at the ranch as kids and eventually got married at the ranch years later. Seems fitting for a property that prides itself on family, doesn’t it?